Boston and Kalamazoo: What is Science, What is Theology? With lots of activity during May and early June, and more to come over the summer, an update on Ordered Universe and related events is called for. To start with, completing the account and reflections on the trip to Boston College, and the 49th International Medieval Congress, University of Western Michigan, Kalamazoo. The first conference involved, from Durham, Giles Gasper and Helen Foxhall Forbes (History), Luke Sunderland (Modern Languages and Cultures), one post-doc, Charlie Rozier (History), and three postgraduate students, all Ordered Universe regulars, Devin O’Leary (Theology and History), Sam Sargeant and Lydia Harris (English and History). We were royally welcomed and entertained by our Boston colleagues, and the conference organised Eileen Sweeney (Philosophy) went off very well indeed. Other Boston presenters included Steve Brown, Matt Kruger, Katherine Wrisley, Nicole Reibe (Theology), Vincent Devendra and Joseph Haggarty (Philosophy), Carolyn Twomey (History), Richard Burley (English), and John Slotemaker from Fairfield University (Theology). 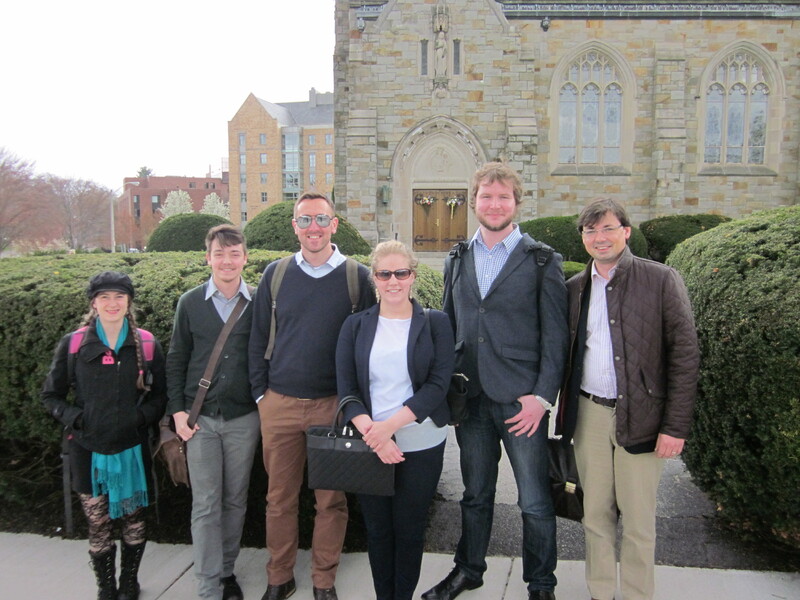 The conference was a joint Boston/Durham venture, and the first we hope of a series. The programme was both wide-ranging and with a core of papers on aspects of medieval thinking about science. Helen, Devin, Charlie, Lydia, Sam and Giles – Luke as photographer. In both the Boston and Kalamazoo sessions a number of questions and issues recurred: what is science? the differences (and to some extent similarities) between medieval thought on the subject pre and post the translation and assessment of Aristotle and Averroes in the later 12th and early 13th century. The reception, absorption and criticism of Aristotle in the second half of the 13th century and first decades of the 14th century, raises the first of these questions pertinently. What Aquinas (1225-1274) means by Faith and Certainty was one particular location for discussion, led by Vincent. Aquinas’s conclusions stress that faith is not certainty, in the Aristotelian sense, but the certainty of adherence, that is commitment to the truth, may be thought analagous to faith. Steve Brown’s wonderful discussion of Peter Aureoli (c.1280-1322), gave a contrasting vision, where the question whether Theology is in fact a science was debated openly and with precision. In an Aristotelian sense it is is not: as laid out in the Posterior Analytics science requires two things: 1) something that is certain and 2) that that certainity might be established on the basis of evidence. Criticism of Aquinas’s position that sacred doctrine can be a science emerged particularly from Godfrey of Fontaine (c.1250-c.1306). One consequence was to sharpen up the definition of what Theology was, and in this the alignment of theology to wisdom, not merely knowledge finds its place. These were debates which Grosseteste might not have recognised in detail, but the issues, of definition form an important context in which to hold his developing contribution to the curriculum, and how the scientific works may be held on the one hand as part of a broadly theological enterprise, and on the other as exercises of demonstration and proof for the particular phenomena at issue in a sense more formally derived from Aristotle and his Islamic an Jewish commentators.